Herb Pickett writing -- The First Tent at Hyde Bay Camp - 1927 - Left to right: Don Tag, Lawry Pickett, Herb ("Sonny") Pickett, Page Smith. This was the tent bought by Herbert and Emily Pickett for their honeymoon trip to Pigeon Lake, Ontario, Canada. 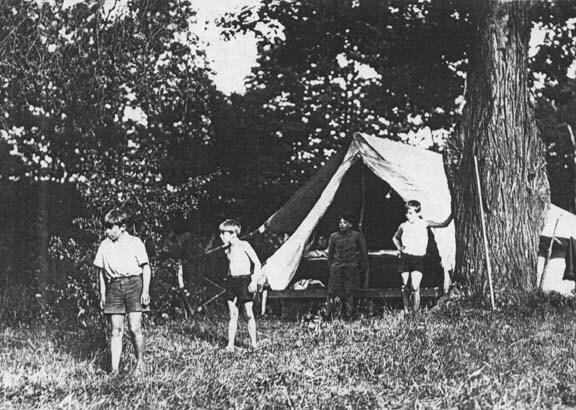 1927, Tent 1 - The first tent group at Hyde Bay Camp. Left to right: Don Tag, Larry Pickett, Herb ("Sonny") Pickett, Page Smith.